As a reseller or BSP, you need to provide a customized email solution for your clients but don’t want the hassle, expense, and technical burden of running your own mail servers. Or perhaps you are simply tired of managing your existing email infrastructure and need out? The solution is simple. Satisfy the needs of your customer base while generating revenue for yourself with XMission’s white label Zimbra Collaboration service. Designed for resellers, technical consultants, ISPs, Zimbra BSPs, VARs, and membership organizations, this program brings the powerful Zimbra Collaboration and email platform to your customer base instantly. Leverage our technology, hardware, and proven expertise as a leading email service provider to compete in the market place. The process is pretty simple to get going. Once you begin your relationship with XMission we guide you through the steps to hit the ground running. – Sell Zimbra hosting to your customer under your own brand. Your customer is your customer, always. Need 50 or 50,000 mailboxes? No problem! XMission’s Zimbra architecture is built to scale rapidly and efficiently. You will not outgrow this platform. Based on open source, the Zimbra backend includes a robust API allowing for easy integration of external systems such as Salesforce, Webex, and many more. Customers can pick and choose the features and services they want for their customer base with custom class of service settings. There are two account types to choose from: Basic and Professional. This allows your customers to mix and match based on needs and price sensitivity. – No licensing to buy, ever! 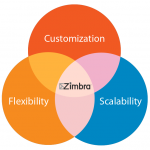 Zimbra provides a consistent and predictable software upgrade and release process so you can count on the platform meeting end user needs now and into the future. Contact John Webster via john@xmission.com, toll-free 877-964-7746 x 105, or direct 801-303-0805 to learn more about Zimbra Infrastructure and how your business can utilize it to build revenue. John Webster, XMission Email Product Manager and Zimbra evangelist, has worked at XMission for 20 years doing his favorite thing: helping companies communicate with customers through technology to grow their business. When he’s not uncovering Zimbra’s secrets you might find him in our beautiful Utah mountains. Connect with him on LinkedIn today!